So here we are with two classics from my hubby aka @groovegenerator. I’m so grateful for the donated photos these days as I almost feel I’ve lost my way. I don’t seem to be coming across the lost goodness very much of late, or if I do I’m either in a car travelling at speed or I don’t have my camera with me. On Sunday David (said groovy guy) and I headed up to Glenridding Sailing Centre for a spot of dinghy madness with some friends. Enroute I spied a fabulous patterned, child’s, pink fleece draped over the railing at Patterdale Hall Estate and was itching to get the shot later in the day but had to get to the lake to catch the Epic swim series. I was all geared up to do the mile swim a few months ago until I read that you have to wear a swimming wetsuit or you cannot enter. I was so disappointed and all it did was raise my usual be-irkedness screaming in my head….it’s just not that easy! I have a love hate relationship with active wear….is that its name? Well anyway…stuff you wear to do whatever sport. If you walk or climb and don’t wear the proper gear then the snobberati rightly or wrongly berate you for putting yourself in danger by being inadequately clad – well then meet the odd shapes half way then! You tell me where you can buy any proper walking/climbing/sailing gear for the 5 foot 2 size 22 woman’s frame! It’s nigh on impossible and much as you want to get into all these actvities – you just don’t find the right attire. There’s a business idea for Lord Sugar and his entrepreneurial elite! Did anyone catch that last night? I know you did and why oh why was it not a double sacking??? Why couldn’t we just get rid of that slimy slippery nausea inducing bullsh*t merchant Jim. Honestly he makes my flesh crawl. And that caustic cow who was finally sacked last night got off lightly if you ask me too…..why did nobody pick her up on being such a god awful bully….I would love Susan to have have waltzed out of the boardroom, gone to give her a hug and just slapped her hard across the face before walking out and leaving a tip for the taxi driver. Am guessing televised assault isn’t the route they wish to pursue…but how the nation would have applauded. So if you’ve lost your way…can I draw your attention to the Burnistoun Rap…I am sure it was made for this blog! 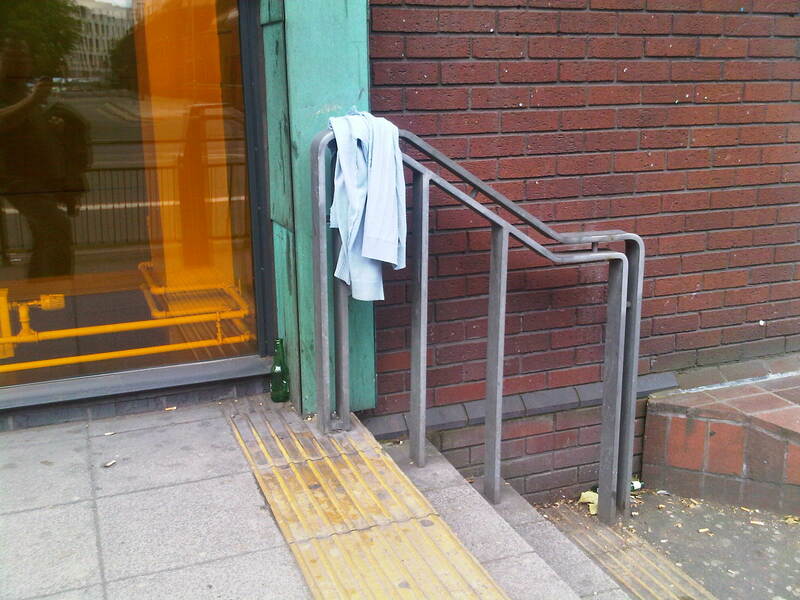 Another donated photo today, from lovely twitter friend @DREAMWALLS, and what a shame. 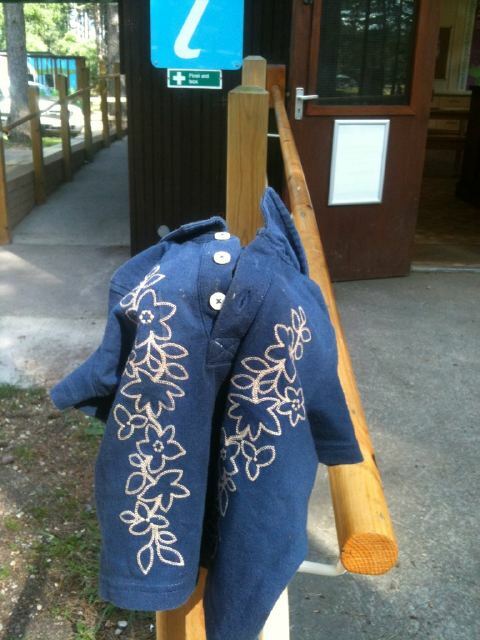 Some little person will be missing this gorgeous coat….some little person’s parent will be kicking themself for not noticing it had gone! I love the detail on this coat, my how children’s clothes have come on in the years since I was so little! 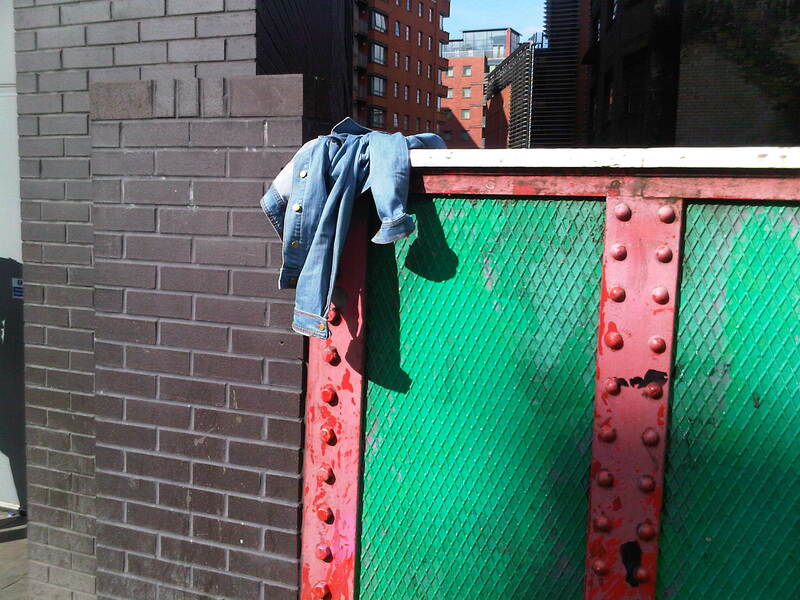 Clothes were always the bane of my young life. I was always a chubby child, always told I’d lose my puppy fat and I never did, and, as a consequence spent many of my young years wearing clothes designed for young women, looking like I’d got a mammoth crush on Miss Marple! I was never cool, let’s put it that way…and long dresses….well they never came in my girth! Gutted. Children’s clothes are just so darling these days that I’ve often wondered if it’s an area newroomsonline should explore. I’ve dabbled from a gift perspective but I think other people do it much better than me, like loveitloveitloveit whose website I love. I was 8 stone at age 8, 9 stone at age 9 and 10 stone at age 10….so you can see where my naive mind was going…..you had to go up a stone for every year of your age. I’d hate anyone to think this was a lack of parental control, far from it, I had three healthy meals a day but I did no exercise worth talking of. As a youngster with asthma in the 60’s it was on the strong advice of the doctors that I did no exercise as it would gravely affect my health. As followers of this blog will be aware, I am currently trying for a baby and my weight, and age, is proving a potential issue. I am surrounded by people telling me age is no problem as women have children well into their 40s, but the weight is a problem. It’s not shifting and I’ve lost all momentum. I swim when I can and I swim anything from 600m to 2km every time, usually averaging 1400m. I was doing quite a lot of walking and running but my famous boredom threshold kicked in when I bought a new pair of trainers, went for a run and literally could not walk or stand or sit within an hour of completing my usual route…so I haven’t been for a month now. Life, eh? If nothing else it’s a hell of a roller coaster and on that note I really must get back to database management and the quarterly VAT return!! It’s an age since I last blogged a loss, so I am playing catch up before the real season of lost stuff commences. Sorry but I’ve been working hard to get newroomsonline‘s updated platform live and it’s full of quirks and things which need getting used to, plus trying to sell our former house, a mother who has had a fall and a sister visiting from the US – it’s all go and not a moment to chillax about the lost stuff! Apologies to all my lovely fans who have donated photos, I promise to catch up. 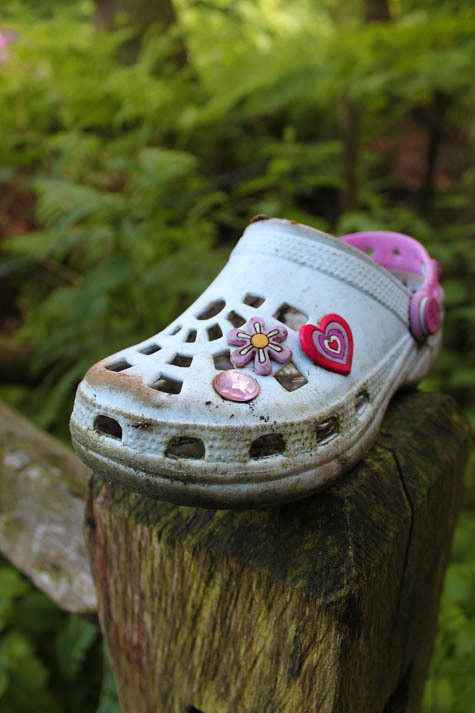 And on that note, here’s a fab one from @markmarkf who spotted this lost Croc in Alderley Edge. Alderley Edge has always had a bit of a magical sound to me purely because as a young girl attending a new school, it was the first class book I remember us reading. The Weirdstone of Brisingamen was set there and while I can remember absolutely nothing about the plot, I just remember it being really magical and loving every minute of it. Latterly I’ve met a few people from Alderley Edge who claim it is far removed from my romantic notions….one former colleague had gone back there only to find her former school had been bulldozed which proved a different kind of magic exists! The book is up there with The Changes. Anyone remember that TV programme? That was another strange but magical plot which half scared the pants off me and half enthralled me. I just remember my sister and I being hooked and all these weird metallic scrapy sounds every time people walked past pylons. And wasn’t the strange force coming from a cave near Sheffield? I half wonder if this wouldn’t be the right time in history to run it again! I know people think the 60’s was psychedelic but hey, the 70’s had its moments too!